New Delhi: Asian countries will not become high-income economies unless domestic demand is made a main driver of growth, the president of the Asian Development Bank said on Monday. Last month, World Bank president Robert Zoellick warned China could fall into the “middle-income trap," where national productivity and income growth stall after per capita income hits $3,000 to $6,000. A similar situation happened in Latin America in the 1980s and 1990s, where export and investment-driven growth did not translate into vibrant domestic markets, resulting in stagnation. By 2050, Asia faces two growth scenarios, Kuroda said, one in which it accounts for about half of the global GDP, with per capita income rising to the current level of Europe and another in which Asia’s per capita income remains at barely half of its potential. Kuroda also warned rising food prices remain a problem for the poor in Asia. Volatile food costs are a major driver on inflation in Asia, where policymakers are trying to fight slowing growth without spurring consumer prices. Speaking at the same meeting, finance minister Pranab Mukherjee said that with quality infrastructure, his country could achieve growth of up to 9% in the medium-to-long term. Growth has slowed to around 8% in India, as Asia’s third-largest economy battles with high inflation and headwinds from debt woes in the United States and Europe. 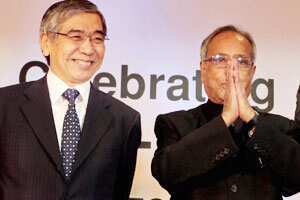 “In the medium-to-long term, India remains firmly on a high GDP growth path of 8.5-9%," Mukherjee said in a statement.